The landmark building pictured is the Stephen A. Schwarzman Building of the New York Public Library which most visitors are surprised to learn is not a circulating library at all, but an impressive research library that has over 53 million items in its collection. Since 1911, it has been a place for scholars and students alike to peruse books, maps, ancient scrolls and even comic books. The "Main Branch" as this building is often called, is one of four research libraries and 88 branch libraries that make up the New York Public Library System. It is a magnificent place to visit, and guided tours are available. See The Rose Main Reading Room - This is the famous reading room that has been featured in countless films and television programs like Regarding Henry, The Thomas Crown Affair and The Day After Tomorrow..
Take a Free One hour tour of the world's 4th largest library in the world. See the original Gutenburg bible and other priceless books and artwork. Really, it more like a museum than just a library. FREE to visit the Library. Free one-hour tours begin at 11 a.m. and 2 p.m. on Mondays to Saturdays. Preferably B, D, F or Q to 42nd street. Ride the back of the Train. The New York Public Library is the 2nd largest library in the United States, with the Library of Congress being the largest. Founded in 1895, The New York Public Library is made up of four research libraries and 88 circulating libraries throughout the boroughs of Manhattan, The Bronx and Staten Island (Brooklyn and Queens have their own separate libraries). The four research libraries are the Stephen A. Schwarzman Building (the Main Library on 42nd Street), The NYPL for the Performing Arts, Dorothy and Lewis B. Cullman Center at 40 Lincoln Center Plaza in Manhattan, the Schomburg Center for Research in Black Culture at 515 Malcolm X Boulevard and the Science, Industry and Business Library (SIBL) at 188 Madison Avenue @ 34th Street. 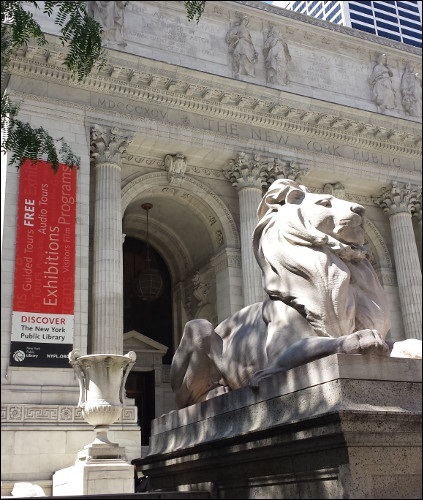 More than 17 million people use the New York Public Library every year and it conducts 67,000 free programs on an annual basis. The library is funded by private donations and public funds.